BMW builds Minis in the UK. LONDON -- UK car production fell again in August, reflecting the impact of uncertainties about Brexit on Europe's second-largest car market. Production declined by 5.3 percent to 103,232 units, hit by weaker demand at home and abroad, the the Society of Motor Manufacturers and Traders (SMMT) said in a statement. In the first eight months, output was down nearly 2 percent at 1.1 million units, mostly due to weaker sales in the UK market. The drop-off follows two years of record demand. "The continuation of the longer-term downward trend in domestic demand is a concern for production across the UK," SMMT CEO Mike Hawes said. "So, it is vital for the future health of this sector that the current uncertainty around Brexit is removed and consumer and business confidence restored." 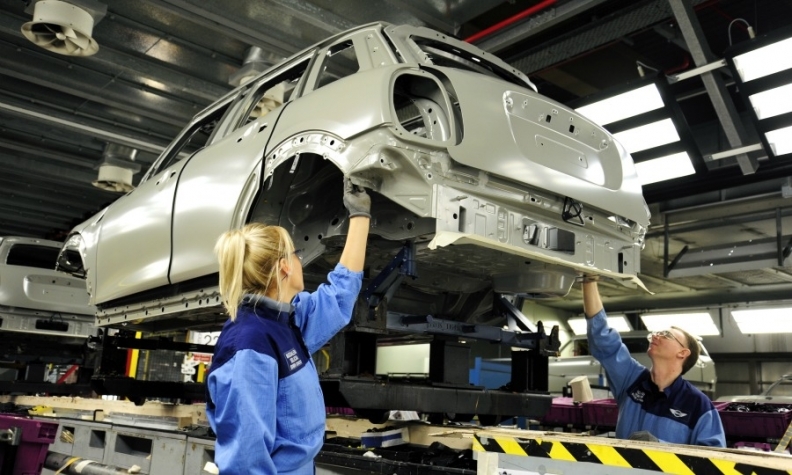 Britain's car industry relies heavily on complex supply chains often involving other European Union countries which could be affected by Brexit. In August, production for UK customers fell by 4.4 percent as the domestic market shrank for the seventh month this year, while 5.6 percent fewer cars were made for export. The SMMT said in July its long-held target of increasing full-year production to just under 2 million units in 2020 was in doubt, in part because of Brexit-related uncertainty. Nissan, Toyota and Honda are among automakers that build cars in the UK, along with BMW Group's Mini and Rolls-Royce brands, Volkswagen Group's Bentley, Tata's Jaguar Land Rover and the PSA-owned Vauxhall unit.